If you're a regular reader of the blog, you may recall that a couple of months ago I got to go to the launch of the SKiNWISE Dermatology clinic here in Winnipeg, which is now a SkinCeuticals clinic. I was pretty thrilled with everything about the event and look forward to going back to the clinic as a client, but I was also really, really thrilled that I would get to try out a customized skin care routine from SkinCeuticals. 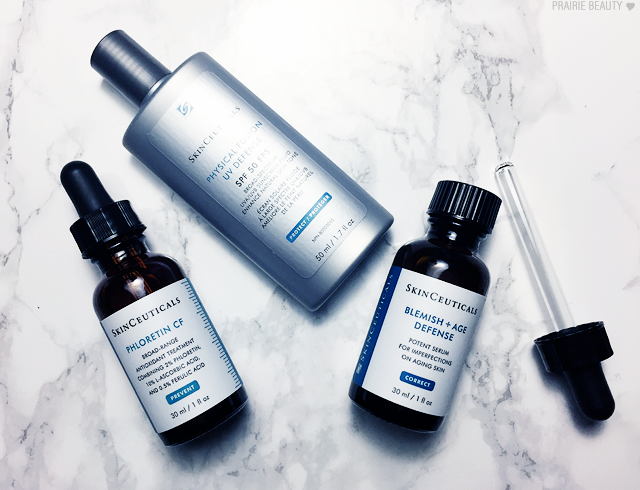 SkinCeuticals has been on my radar for ages, but I hadn't gotten the opportunity to try out any of their products yet, so I couldn't wait to get these products onto my skin. I've been using all three of these products consistently for about 8 weeks now and I'm definitely ready to give my full thoughts on them! Let's talk about the SkinCeuticals philosophy for a moment, because I think that really gets to the heart of what the company is about. 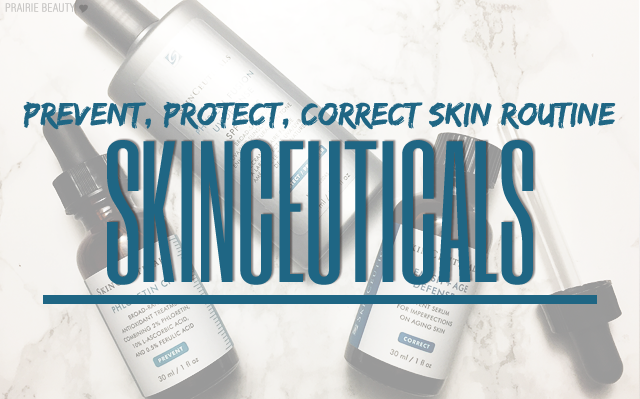 The Skinceuticals skin care philosophy centers on three main pillars: Prevention. Protection. Correction. Basically, the idea is to PREVENT future damage to the skin, PROTECT the skin from environmental damage, and CORRECT damage that has already been done to the skin. I really liked the way this philosophy was laid out for me, because it makes it really simple to understand for pretty much anyone. I also like that SkinCeuticals products are backed by science, as the more I learn about skin care in general, the more interested I personally am in using evidence based skin care products. This was by far the product of the three that I was dying to try, because I knew that SkinCeuticals was known for their antioxidants. While I'd heard more about the CE Ferulic, which is pretty much their most famous product as far as I can tell, I was advised to try this one for my skin type and needs and I've really been enjoying it. The texture is quite light and it smooths over and soaks into the skin fairly quickly, making it perfect for my ever-rushed morning routine. Overall, I've found that I've seen an improvement in the appearance of uneven skin tone since I've been using this. The biggest evidence of this? I've been reaching for lighter coverage foundations recently and really enjoyed the look of my skin showing through the makeup, which is a completely new experience for me. I've also noticed a difference in the appearance of some acne scarring I have on my cheeks, both in regards to texture and pigmentation, though I wouldn't say that it's been drastic. Admittedly, I hadn't heard of this product before it was recommended to me personally, but as soon as I heard the claims I was fully in to try it out. I'm definitely one of those people who got into her 30s and started seeing signs of aging, but was still struggling with breakouts, so this seemed to be right up my alley. I've been using this at night, alternating between this and a lactic acid product that I've also been testing out. I find that there's a slight tingle to this product, but nothing uncomfortable, and it settles in quickly. This is a HUGE winner for me. I've seen a drastic decrease in breakouts and clogged pores since I've been using this product. I still get the occasional spot, generally during PMS, but even those breakouts have been much smaller and healed much more quickly than the deeper, more stubborn breakouts that I was used to. As a result of the clearing up of my skin, I've really noticed that my skin really looks younger and healthier since I've been using this. In the past I've been a little bit too devil-may-care about sun protection and as a result I do have some sun damage on my face, but since I've been using retinoids and hydroxy acids in the last year, I've really been trying to be diligent about sun protection. The problem? I've always hated the way sunscreens feel on my skin and wear under makeup, which has made me less likely to wear them. This one has honestly been a game changer for me and I really don't see myself straying from this product any time soon. This is a lightly tinted physical sunscreen, which I love because the tint helps to eliminate the white cast that so many other physical SPFs I've used in the past have left on my skin. It's quite thin and silky in texture and I find that it smooths over the skin really beautifully. The thing that really cements this as a favorite for me is how it sits under makeup, because that's always been an issue for me in the past. This is seamless and, in fact, I think it even acts a little bit like a primer on my skin to make everything just look a little bit more flawless. I'm obsessed and already planning to pick up a backup soon, just so that I always have this on hand. 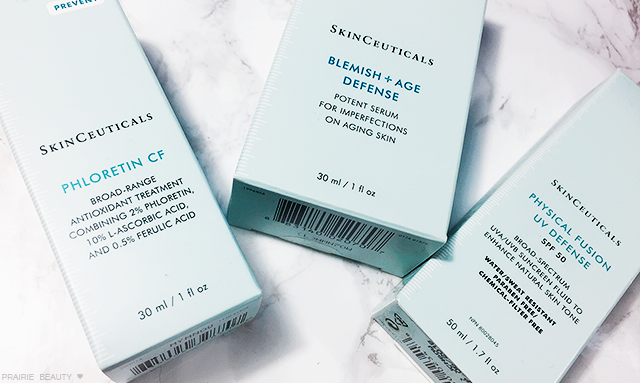 Overall, I have to say that I'm really impressed with SkinCeuticals as a whole and I'm definitely looking forward to trying out more of their products in the future. For me, the biggest winner of the bunch is also the biggest surprise. 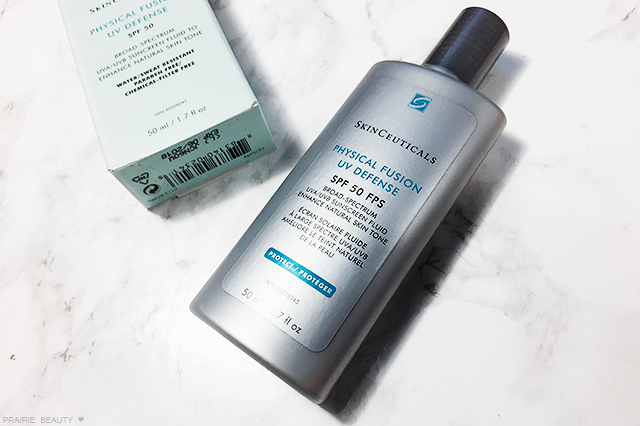 I didn't think that there was any way that I would fall in love with a sunscreen, but the Physical Fusion UV Defense has completely won me and I'd even go so far as to say that it's reached Holy Grail status in my collection. If you're in the market for a daily sunscreen for your face, I would definitely nudge you in this direction. 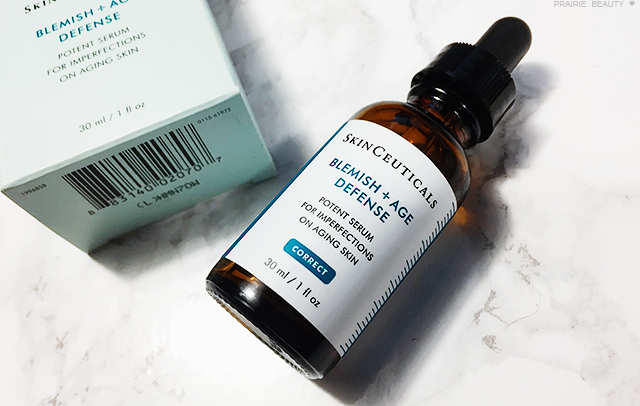 I also really love the Blemish + Age Defense, since it's done such a great job with helping to clear up my skin, and I will happily continue to use it as a part of my routine. 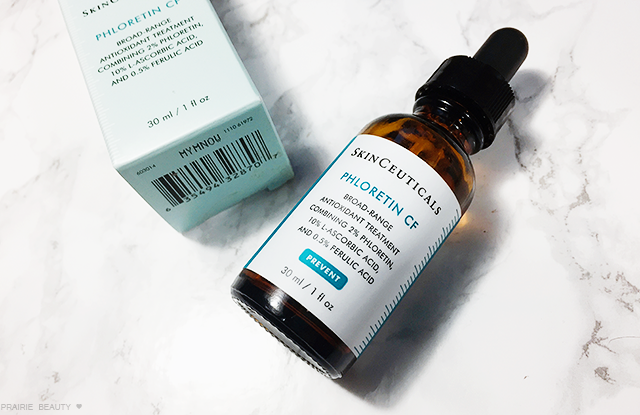 While I liked the Phloretin CF, I think I'm actually interested in trying out the CE Ferulic in the future.